Teenage Pregnancy in United States of America has been a hot topic especially because the teenage pregnancy rates in USA have been higher historically than any other industrialized nation in the world. That is a troubling statistic to say the least considering the fact that teenage pregnancies are prone to higher health risks which we are going to explore later in this article. 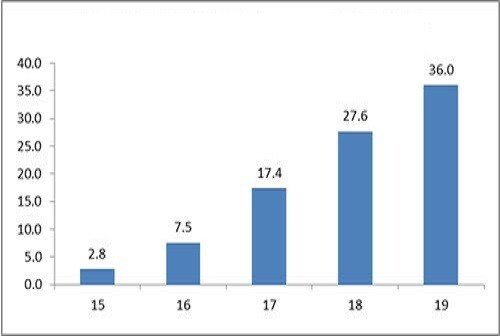 There is a ray of hope at the end of the tunnel however as the sexual education in Junior and High Schools in USA has improved the statistics in the country’s favor. 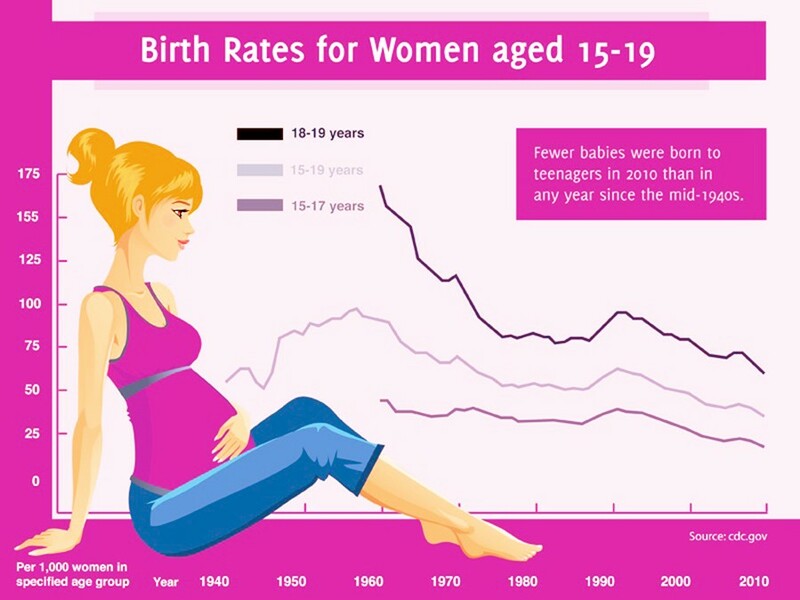 The teenage pregnancy rate has declined by an astounding 50% ever since the all-time high pregnancy rate in 1991. The steady decline of that rate has been attributed by the CDC as teenagers opting for using condoms or some sort of birth control pill more than before. Also, the abstinence program in several of the state schools has actually led to lower teenage sexual activity. Many of these pregnancies end in abortions and in inadequate conditions, and specialized medical services are scarce and expensive because abortion is illegal in some countries. Last year, the birth rate for teenage women was 24 per 1000 women. That is a welcoming statistic considering the birth rate for teenage women in 1991 was 61 per 1000 women. Now the birth rate for teenage women should not be confused by the rate of teenage pregnancy. Just over half of the teenagers that get pregnant actually end up carrying the baby to term. According to the CDC, the breakdown of birth, abortion and miscarriage from teenage pregnancies are as follows; 60% of the teenage pregnancies end in a live birth, around 12% of the pregnancies end up in miscarriage, while a high 28% end up in abortion. Most of the teenage pregnancy in USA happens from ages between 15 and 19. Around 0.06% of the total teenage pregnancies happen at the age of 13-14. It is projected that only 20% out of the total teen pregnancies are actually planned, it may not be a coincidence that most of those pregnancies are inside a marriage. The Asian immigrants and the US citizens with Asian ancestries actually have the lowest teen pregnancy rate, 22 out of 1000 women. 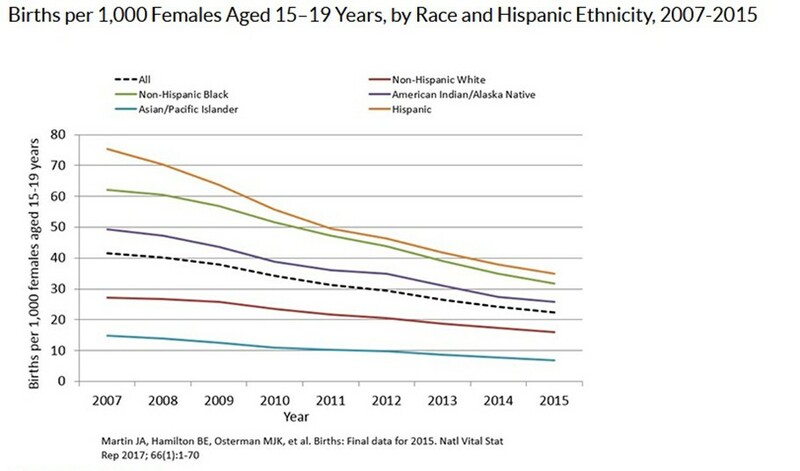 Black, Latino and Native Indian women actually have the highest teen pregnancy rates with around 60 women per 1000. White women are middle of the road with 43 out of a 1000 getting pregnant before they turn 20. The highest teenage pregnancy rates in United States of America are observed in the Southern States as well as the Southeast states. New Mexico, Texas and Mississippi that are the poster boys for southern states have the highest teenage pregnancy rates with 80/1000, 76/1000 and 73/1000 respectively. Washington D.C may not be considered a state by area but it is an autonomous district and it is shocking to see that such an education area has the highest teenage pregnancy rate of 90/1000. The states in the middle and mid-west of USA have average teen pregnancy rates. Case in Point, Ohio has 54/1000 birth rate, Indiana 53/1000 and Nebraska with lower than average at 43/1000. As discussed before, the lowest pregnancy rates are in Northeast states with New Hampshire having the lowest at 28/1000. Massachusetts also has a low pregnancy rate of 37/1000 and Vermont has 32/1000 rate. Of course there are anomalies here and there with New York having 63/1000 pregnancy rate among teenage women. Virginia is a southern state but the pregnancy among teens here is average with 48/1000. Teenage pregnancy in USA has been a cause for concern for the past three decades but the steadily declining birth rates indicate that the country is heading in the right direction at least for now.